Whisk together all of the dressing ingredients in a bowl or small pitcher. Put the noodles, bean sprouts, snow peas, sliced pepper, and sliced scallions into a bowl . Pour over the dressing and mix thoroughly to coat everything well. Sprinkle with the sesame seeds and cilantro and pack up as needed. 1Whisk together all of the dressing ingredients in a bowl or small pitcher. 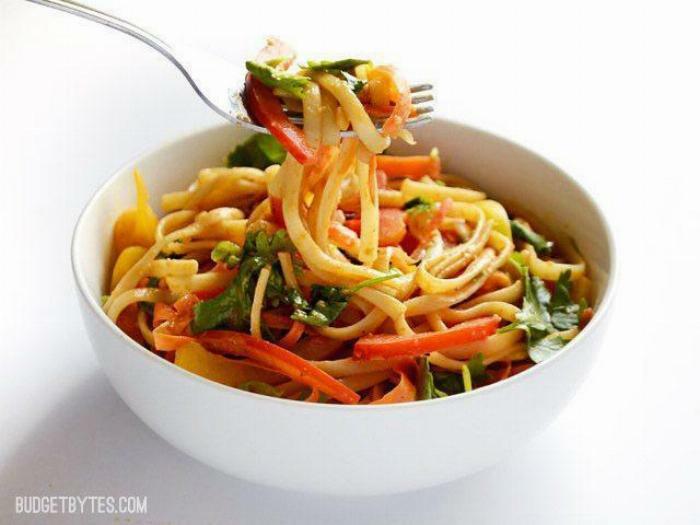 2Put the noodles, bean sprouts, snow peas, sliced pepper, and sliced scallions into a bowl . 3Pour over the dressing and mix thoroughly to coat everything well. 4Sprinkle with the sesame seeds and cilantro and pack up as needed.